Who’s Coming Up on Monday, February 20? Who’s coming up on Monday February 20? 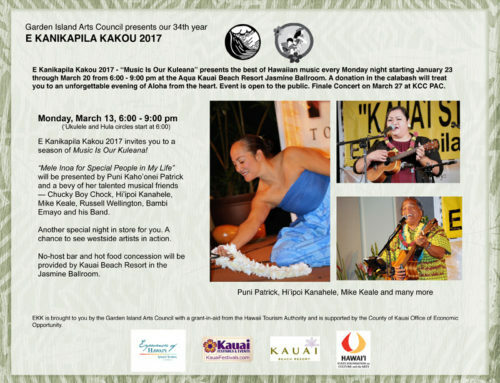 Last Monday night was quite a shift in Hawaiian music for the EKK enthusiasts that filled the Kaua’i Beach Resort Jasmine Ballroom. From the get-go, Dave and Dona Cunningham, volunteers extraordinaire, had the corner of the ballroom hopping with a pre-performance swing dance lesson. What a revelation to me to see so many folks just loving to dance. It was a joy to watch! Ballroom was my passion as a teenager so I felt a bit envious to see so many happy bodies cutting up the rug. All of this in preparation for the big sound swing music from the Kahulanui Big Island Swing Band; they certainly did not disappoint. It was also great to see a number of island musicians in the audience. It was exciting just to watch the members of the band, looking dapper in their matching black hats, black suits with bright purple and yellow aloha shirts, sprint lightly up to the stage and find their stations behind their Kahulanui cardboard podiums. It was a packed stage and they filled it with music and action from the start to the very end. 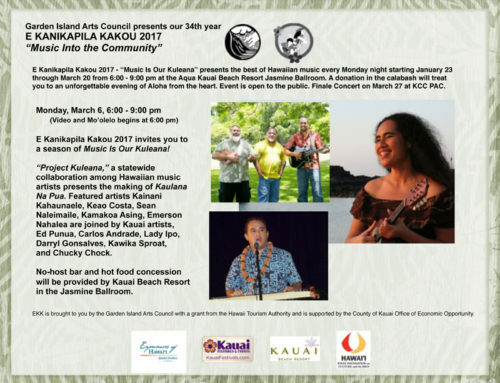 Kahulanui took us back to the 20’s and 40’s with the big sounds of the Swing Bands, music that many of us love and remember so well because we grew up with them even in our school proms and stage performances. 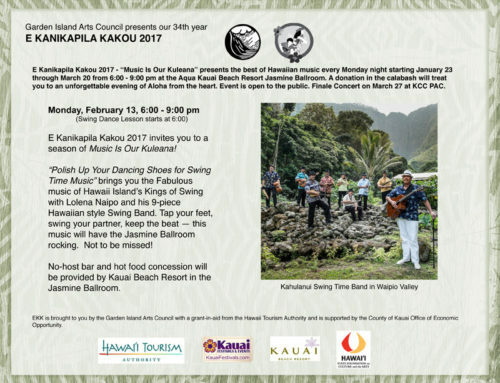 Kaua’i being their favorite island, Lolena Naipo, leader of the Kahulanui Band, launched intoNani Waimea/Nani Wai’ale’ale, singing the lyrics in falsetto and throwing in his low chants in a deep bass gutteral voice. It was all there! He started with a chant-like monotone so it felt very Hawaiian but visually the band members had the syncopated motions to accentuate the beats and they captured the big sound of the swing band. He showcased his musicians throughout the performance, giving them many chances to shine with their respective pa’ani; it was so exciting to watch them belt out their solos and the group uniformly snapping their instruments from left to right to punctuate the music. Naipo took old songs from his home town in Waimanalo and changed them in the Kahulanui style. He talked about his recollection of Ray Kinney and Lonny McIntire in the old days, about New York big band sounds, and the early era of Hawaiian music. People told him he could not do it, but he found a core of other young musicians who believed in his vision and joined him to form this Hawaiian style big sound band. With a big smile on his face, swaying left and right with each strum, Lolena kept up the pace and the whole group followed. Pat Eskildsen Jr., on the bass, is the right-hand man of the group and works hard to make sure that all arrangements for their gigs are tended to in a timely fashion. He was a joy to work with. Jesse Snyder, on the tenor saxophone and clarinet, heads the horn section and was one of the first to believe in Lena’s vision and has worked with the group from the beginning. Bill Noble, the senior member of the band, cuts loose on the alto sax and the flute and often steals the show with his dynamic solo playing. Tim Nohea Taylor, originally from Philadelphia, on drums is another one of the nucleus group of Kahulanui. Besides giving us lively energetic burst of drum beats from the back line, he gave us a great deal of insight into the workings of the band. “How do you guys rehearse when half of you are from Kona side and the other half from the Hilo side?” “We really don’t rehearse that much because we are all professional musicians and we are able to get together and play without too much rehearsal.” Lena takes the lead and we all follow. That is pretty amazing. 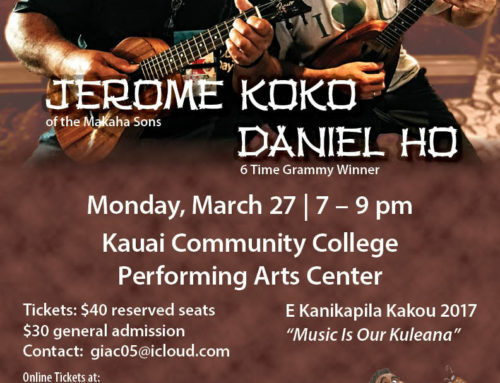 Duke Tatom on ‘ukulele; handsome young man has the Kinimaka good looks because he is related to them; his grandmother is originally from Kaua’i and he has enough aunties and uncles on Kaua’i to fill a bus – the Kinimaka Family. It was amazing to watch him get his ‘ukulele keep right up there with the rest of the instruments. Dwight Tokumoto, on the steel guitar looks familiar, because he came with Lito Arkangel last year. The steel guitar sound is really essential in recreating the sounds of early Hawaiian music, and Dwight was certainly up to the challenge. Josh Timmons, on trumpet, is one of the youngest members of the group but can he get that trumpet to sing! After his solo in Waikiki Chickadee, several requests came from the audience for more solo by Josh. It was such a rousing number when all those horn guys stand up and play… the audience was just busting out of their shirts and cutting up the rug in the back of the room. As many folks as were dancing during the first hour, the dance floor was filled with the really professional-style dancers who glided gracefully around and around the spacious floor. Many were just happy to be bobbing around in their seats and keeping the beat by slapping their thighs. No matter what they did, the audience was right there with the great sounds coming from the stage. 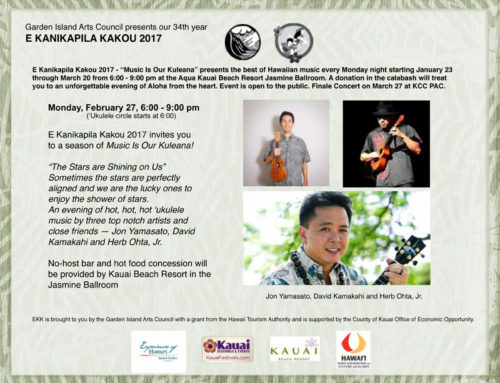 The trombone player, 21-year-old Vincenzo D’Angelo, was unfortunately unable to make it to Kaua’i at the last minute. In the Late 60’s and 70’s, contemporary music was big but Lena was a child from Waimanalo where he lived a few houses from Gabby. While the others kids were out playing, Lena hid in the bushes and watched Gabby Pahinui, Atta Isaacs and Sonny Chillingworth playing music together. All this early exposure to that style of playing has influenced much of the music he brings to Kahulanui. He grew up listening to Gabby singing Hi’ilawe so he started singing this famous song from Waipio Valley moving from falsetto to a deep raspy guttural voice that scraped the river rocks at the bottom of the river. “Gabby was also an avid steel guitar player,” he recalled and he called on Dwight to add the sweet sounds of steel to this song; then the unexpected high tones of the flute by Bill Noble made one think of the sounds of the gossipy birds in the Waipio valley. Nohea the drummer adds to the Hawaiian beat with the ipu heke instead of the regular drums. This version of Hi’ilawe was really quite surreal because he was transporting us all right there into the valley. Lena talked about local parties where everyone drank cases of Primo beer; at every party someone was bound to start playing Sweet Someone. He earlier told Jesse Snyder this is the crappiest song of all, but when they played it at a party with Jesse’s sax solo, he had to change his mind because he liked it after all. “When I heard it this way, I loved it!” “I never knew what my grandpa did.” He found out late in life that he grandfather had been the assistant band leader with Royal Hawaiian Band; he was also part of the Army band and he had his own 16-piece band. “If my grandpa heard this, he would freak out!” Everybody told him not to do this type of music but he did it and here is the result. It’s different; it’s original; no one else does it quite the same way. He recalls listening to this voice, the voice of his grandpa Robert Kahulanui, sitting with his ‘ukulele and singing Noho Pai Pai or “The Rocking Chair Song”. He sang it with his grandpa’s voice. Young Josh Timmons played a fantastic trumpet solo; this was a song for the horn section, but frankly, I had never heard Noho Pai Pai played quite that way and with that kind of lively beat. Makes you wonder what goes on with that rocking chair. The gang of volunteers at the back of the room were jumping around like Mexican jumping beans and so were all the musicians. Just before the intermission, the wonderful Lady Ipo came up to the stage and demonstrated the Kamoa ‘ukulele singing Susie Anna E in her sultry voice. After the intermission, the winner was announced and a very happy Gale Glass from Washington state was the lucky winner. The second half was just as spicy as the first half with the three-man horn section bouncing up and down with short solos that were just plain thrilling. 2016 was a challenging year for artist John Cruz. “In the Pacific Ocean, family is everything,” Lena led off, acknowledging the Cruz family who suffered big losses with the death of Ernie Cruz Sr., followed by the untimely death of Ernie Cruz Jr. After that John Cruz lost his little brother Guy Cruz. He launched into a song that we always hear as a light and happy look at family life in Hawai’i. I never hear such a nostalgic version of We do it Island Style with the rippling sound of ocean waves and an almost wailing quality describing all the familiar scenes in grandma’s home; changing it from a happy-go-lucky playful musical description of family life in Hawai’i to a sensitive reminder of the often over-crowded family gatherings where everyone is busy interacting with each other from the mountains on the windward to the oceans on the leeward side. It was quite a rare and beautiful rendition of the well-known Cruz song. Lena talked about his wife, a hula dancer, and this song just came to him —Papa Lina Lahi Lahi— a huge smile on his face, gravel voice scraping along the bottom, rocking his head back and forth, calling out solos from Dwight on steel, letting out shouts, signaling to the horn section; he was always getting scolding from the kupunas, “What is he doing with that song?” “Main thing I am enjoying myself!” and he grinned from ear to ear while hula dancers popped up stage left, stage right and in the aisle. From one hula number to another he started to play a song that sounded likeYakahiki Hula; not sure there really is a hula song by that name, but he sang it so it must be a real song. He then launched into a lively Hawaiian mele where all the guys and the audience were shouting out verbal punctuations about hula. Boy! that guy Bill Noble really puts on a great solo pa’ani and the band never lose the beat! “We were starting to lose the young folks because the young crowd was turning to reggae music but we need to do this kind of music,” said Lena and launched into a very sophisticated rendition of a song by Teresa Bright. Noble’s flute and Tatom’s ‘ukulele often carried the melody in a most unexpected way…about surfing in the ocean. “Have you ever heard of the group Hawaiians Unlimited?” asked Lena. “We were they; we just changed our name to Kahulanui and get scolded all the time for doing that but it’s okay.” They then played one of the songs on their original CD in which the flute player piped in with his high bird-like melodies. No wonder he steals the show all the time; Bill Noble is one really talented musician. Lena’s style of calling for pa’ani from his band members is really subtle. He points vaguely in some direction or turns his head to one side and various instruments join in with their solos. Pat Eskildsen acknowledged their dynamic leader, “Lead singer! Mr. Lena Naipo!” He then swapped instruments with Pat and accompanied Pat’s guitar solo on the bass and then stood up to give a solo for a grand finale with the big band sound. “We love Hawai’i island so so much where we live the life of the gypsy musician. We live in the middle of the Pacific Ocean – ‘On the island…in the middle of the sea’; god is good all the time.” Two hours of playing and all the musicians are still bouncing around on the stage. All this was really contagious because the back row of the hall was bouncing everywhere as well. Of course the EKK audience just had to sing Hawaii Aloha to feel that the evening had come to a full and complete close. What a fun evening! Just did not realize how much folks love to dance.